Posto, a modern interpretation of a classic Italian pizzeria, enoteca and trattoria all presented in a "Farm Chic" open air concept, is a fantastic new addition to Davis Square. 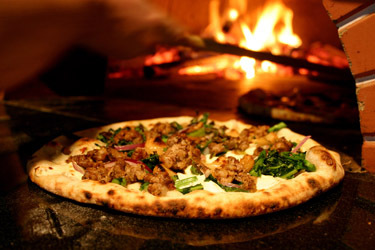 Specializing in true Neapolitan Pizza according to Verace Pizza Napoletana standards, using only the best "00" flour imported from Italy, San Marzano tomatoes and Fior di Latte Cheese that, of course, is cooked in our wood burning oven. Posto features an exciting "small plates" menu, hand-made pastas, specialty cocktails and a very extensive wine by the glass list that is centered around "Enzo," our imported Italian wine preservation system, while providing a family friendly, approachable dining venue. We support local artists, farmers, and ranchers whenever possible. Come to Posto and watch our family prepare your food in our open kitchen dining room or enjoy al fresco dining on our seasonal patio. Open for dinner daily and brunch on Sunday. We look forward to seeing you soon at Posto. Ciao!